Eldest ancestor Heinrich Marhein/Marheim (1618-1667), son of Henning, moved from Hamburg to Sweden. His son Augustin Marheim (1654-1732) was ennobled in 1693 with the surname Mannerheim. His son Johan Augustin Mannerheim (1706-1778) was created a Friherre in 1768. 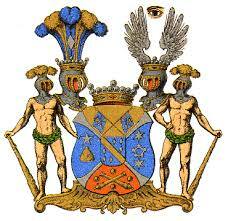 The family was incorporated in the Finnish nobility in 1818. Johan Augustin´s son Carl Erik Friherre Mannerheim (1759-1837) was created a Finnish Greve in 1824. His grandson Carl Gustav Emil Friherre Mannerheim (* 4-6-1867 + Lausanne 27-1-1951), was Regent of Finland after its independence from Russia from 1918 to 1919 and was mentioned as possible candidate for the Finnish throne in 1919. He was Marshall of Finland in 1942 and President of Finland from 1944 to 1946.